Dover, New Hampshire is a reborn mill city recently revived by a high-tech makeover, yet still keeps its historical roots well planted. With four different rivers running through Dover, the Bellamy, Cocheco, Salmon Falls, and Piscataqua rivers, this town was an important shipbuilding center. In the 19th century textile manufacturers took over and built brick mills all along the river banks, which still stand today. Dover is known for its entrepreneurial spirit and the high-tech companies that have inhabited the downtown area. These high-tech companies range vastly in size, from 20 employees to 200, so there is a lot of career opportunity and growth to be had in Dover. Although Dover has undergone some economic advancement, the historic town is still intact. The riverside mill-town feel of downtown Dover is still as present as ever, and its surrounding neighborhoods are filled with homes that radiate New England charm. Nestled in between the mountains and the ocean, Dover, New Hampshire provides the perfect location for every type of home buyer. The town of Dover is a short drive from its neighboring community of Portsmouth, a short drive from the coastline of Maine, and just under an hour away from the large city of Boston, Massachusetts. Traveling is easy when in Dover, with multiple airports within an hour from town, and easy access to rail and highway transportation routes. 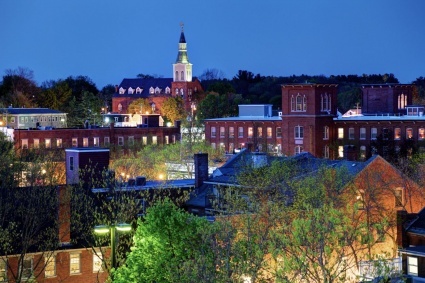 Living in Dover, New Hampshire provides a lot of local amenities, such as a lively and colorful downtown, a variety of local restaurants and bars, historical features and architecture, shopping, golf courses, and parks. The residents of Dover also boast about the quality of life, and rave about their exceptional school system, recreation services, and their premier medical facilities. Although it is a popular area, buying a home in Dover, NH is more affordable then you may think. The median home value is $236,000 with a median income of $61,008. Homes in Dover, NH vary in style - whether you’re interested in modern or historical, there is something for everyone. Homes common to the area range from old colonials and Victorians that drip with original historical character and intricate detailing to contemporary and modern styles, with up-to-date amenities, clean lines and minimalistic detailing, perfect for buyers who want to put their own stamp on the place. If you’re actively looking to buy a house in Dover, get in touch with us at Verani Realty, your trusted and driven realtors in Dover, and throughout the great Granite State. Or, start browsing homes and real estate for sale in Dover, NH online today. When you’re ready to make a move, we’re ready to show you the best Dover, NH homes that are available on the market today.